I’ve finished half of the Bailey’s Prize shortlist so far. Rather than wait until they are all completed I decided to get my thoughts down while they are still fresh in my mind. I’ve listed them below in the order I liked them. You will notice that this year’s winner is in last place so far on my list. Shortly before I began reading Outline, I saw somewhere online that the protagonist’s story was not told outright but rather was reflected in the stories recounted by various characters throughout the novel. Whether correct or not, I found this interpretation incredibly enlightening as I read the book. In fact I wonder what I would have thought if I hadn’t had that seed planted in my head. It is likely that I would have referred to it as a bunch of vignettes or something like that. Indeed there really isn’t one overarching plot, and the novel does appear to be a bunch of unrelated anecdotes tied together by the fact that the main character comes across each of the characters and their stories while she is in Athens to teach a seminar on writing. We get a few bits of information about Faye along the way: she is a writer from London with kids and an ex-husband and isn’t too interested in any future romantic entanglement and a few other things here and there. More than a few reviews I have looked at focus on the notion that this is a book about story telling. How our stories outline our lives, how what we choose to put in and leave out of our personal stories is telling not just about ourselves but about the act of storytelling itself. Given that Faye is a writer teaching a writing course where we hear her students outline their own autobiographical and fictional stories, this seems like an entirely apt and satisfying way to look at Outline. But I prefer the preconceived notion I had when I began the book. The notion that as all these other characters told their stories they were actually telling a part of Faye’s story. The stories Faye extracts from the people she encounters, regardless of the specifics, seem to be telling something about Faye’s own life and her quest for meaning as it relates to family, relationships, children, career, gender roles, etc. But the word ‘quest’ isn’t right, they are more like reflections. Each story hold’s up a mirror to Faye’s own experience. She seems like someone in a mid-life crisis who doesn’t quite know who she is or what her next step should be–or what her life has meant either to herself or to those around her. Outline has all the introspection of an Anita Brookner novel, but rather than wandering around in the mind of the narrator, her thoughts are all provided to us through the mouths of other characters. These stories reflect a lot of loss and pain and unrealized dreams but the sum total never felt to me like a wasted or sad life. Perhaps I feel this way about Outline, because I feel this way about my own life. Not disturbed, but deeply reflective of what has brought to this point in my life and what might be next. I haven’t read an Anne Tyler book since I read (and enjoyed) The Accidental Tourist in about 1989. Kind of nice to know Tyler is having some serious longevity and still getting shortlisted for awards, and for her 20th novel no less. The review in The Guardian, while not necessarily representative of all my feelings about the book, reminds me why professional reviewers are still important. They can articulate things much better than I can. For instance all I could think was “readable” and “straighforward” Kate Kelleway really gets it right. The extraordinary thing about all her writing is the extent to which she makes one believe every word, deed and breath…What is most remarkable about it is the extent to which Tyler is able to relax into an ordinary, homely minor key while keeping one as absorbed as if it were one’s own family she were describing, and as if what happened to them were necessary reading. The book is no less eventful than ordinary life – and that turns out to be more than enough. This is exactly what I liked about this book. And, although it is a multi-generation tale, it was Abby’s story I liked most. Older married woman with grown children and grandchildren and her connections she has with them and her past and the house they live in. (In fact the old family house is such an important piece of the story, I am surprised it wasn’t somehow in the title.) We are also privy to Abby’s thoughts as she begins to exhibit what seems like might be the early stages of dementia. There are moments and emotions that I thought Tyler captured so perfectly. The kind of stuff I wanted to underline and go back to later. Many, many, things I liked about the first, and longest section of the book. One thing I didn’t quite like was the story line of the prodigal son who in my mind takes up too much of the resources of the characters and plot without really paying off in any meaningful way. But overall I found this section of the book compelling and pleasingly gut wrenching. Then the final two sections take us back in time to fill in some back stories of long dead characters and introduces some additional complications for the living. But after the events of the first section, I didn’t want to go back in time. I wanted to stay with the issues and feelings already introduced. I love resolution in a book, but in this case I would have preferred to leave it after the first section. Of course I had to read the rest of it to know that that was the case. I don’t think many will agree with me on this point, and it wasn’t that the second two sections were bad, not by a long shot. But I think when I go back to re-read this someday to look for those passages I didn’t underline this time, I will stop at the end of the first section. Much has been written about this novel, and no doubt much more will be written now that it has been chosen winner of the Bailey’s Prize. I didn’t like it at all. I got over my dislike of the main character George (Georgia) and her way of speaking (Smith’s writing). I got over my dislike of the san serif font. I got over the fact that the pages were left-justified. I got over the lack of quotation marks to denote dialogue which required a million instances of “she says” “George says” “he says” “etc. says”. I got over all of that to get to the point where I found the story interesting and felt emotionally involved. And then we come to part two and we find ourselves in Renaissance Italy. Okay, time to switch gears. I got over all the various quotations…got over the poem-like start of the section by not worrying about understanding it…then I got over the…no. No, I didn’t get over the rest of it. I didn’t care two figs for any of the second section. I found it painful and tedious. I can’t say that this was a gimmick in search of a story. There was plenty of depth and plenty that I might have found compelling if I hadn’t had to spend all of my time dealing with Smith’s too cool for me style. Previous Article Why didn’t Eric inspire me sooner? Part I didn’t care to listen any longer was a bit disappointed with her winning really. I can understand why people can be drawn to that kind of cleverness. It is just rarely the case that I am one of them. I also REALLY disliked How to Be Both, and nearly didn’t make it through the second half. It was a book I was really excited to discuss with my book club, but it ended up that we all pretty much hated it and there wasn’t much of a conversation to go on. I think I had kind of discounted A Spool of Blue Thread as fluff (maybe because of the cover? *ducks*), but I think you have me sold on it. And as an aside, I’m really bummed to see that Sara Taylor’s The Shore didn’t make the shortlist…it’s one of my favorite books so far this year. How surprising How to Be Both didn’t inspire much conversation with your book club. I think the book is so rich with detail there is lots to talk about. It’s interesting to hear people’s different extreme reactions to this book. I’m also really disappointed The Shore wasn’t on the shortlist. It’s a beautiful ambitious complex puzzle of a novel. I wish it had been there over Outline. I can see that there would be many layers to discuss about How to Be Both. But I think if one found the style of narrative on the tedious or annoying side as I did, it makes one not want to discuss the layers. 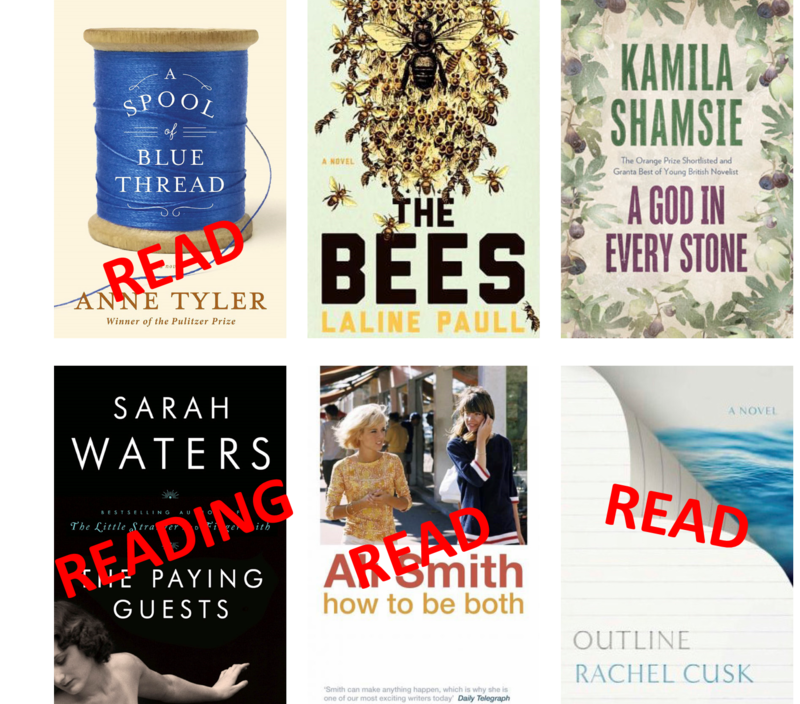 I had planned to read the Baileys shortlist this year… But read the Stella prize shortlist over March/April and shortlist stamina had waned! Still intend to read The Paying Guests and How to be Both (eventually). I don’t know anything about the Stella Prize. Sounds like something I am going to have to look into. I’m loving reading your reactions to these books – so different from mine! I get all that about what Cusk was saying about how we present ourselves with stories and I did enjoy reading it, but in the long run it’s left me without any emotional connection. On the opposite side, even though I read How to Be Both last August, I can still recall the emotions I felt reading it – particularly the aspects of both sections that deal with mourning and loss. With Tyler I agree with everything except I felt the last two parts were essential and what made this book stand out as interesting and different. The way she tunnelled back through the generations reconfigured the received notions about the family’s identity so you learned their origins were different from what the grandchildren believed. It made me think about my own family and (while obviously my ancestors had complex lives I can never know about) all I have are scant stories passed down through the generations and old photographs which leave me unable to know their full story. It really does come down to personal reactions doesn’t it. I truly felt like Outline was nothing but emotional connection for me. Perhaps it is an age thing. As I inch ever closer to 50 (46 in August!) I am very reflective about life and found Cusk really tapping into so much that I feel and think about. On the other hand I felt HTBB was a very young voice that I didn’t connect with at all. As it relates to the Tyler, I felt like she didn’t tunnel enough. In particular I felt the two sons and their stories were dangled in front of us but never fleshed out in a way I thought was meaningful. And oddly, with the exception of Abby, I really felt like the female characters were given short shrift. The daughters might as well not even have existed. I agree with you about HTBB but Ali Smith but don’t think it is an age thing but an emotional detachment thing which I have found in Ali Smith’s other work which is also clever but somehow cold whereas Cusk is clever but always writing with underlying genuine emotional unresolved conundrums I feel which power her writing and give it momentum despite it being nevertheless wonderfully clear and precise. I’m older than you (!) at 53 but I’ve never liked cold clever books no matter how dazzling – humble and funny rather than clever and dazzling every time please! By the way, you MUST read The Paying Guests! It’s gripping and brilliantly written. Hi Thomas, like your new home! Loved the Cusk. I’m a huge fan of Anne Tyler but I did feel that the book lost its Mojo after Abby the matriarch died. Good review.